Compulsive need for and use of a habit-forming substance (as heroin, nicotine, or alcohol) characterized by tolerance and by well-defined physiological symptoms upon withdrawal; broadly : persistent compulsive use of a substance known by the user to be harmful. That definition does not include technology. But many of us are literally addicted to our digital devices. 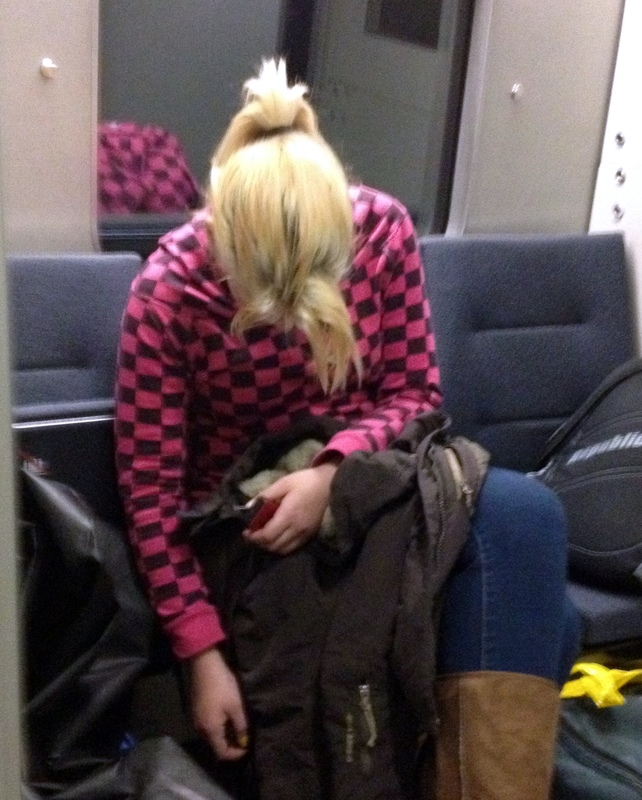 In the image above is a woman who’s fallen asleep while using her smartphone. According to eMarketer™ smartphone users will total 1.75 billion this year. And 4.55 billion people are expected to be using some type of mobile phone. How many of those folks do you suppose will become addicted to their phones? Do you feel lost without your mobile phone (or other device)? Do you sleep with your phone nearby? Do you answer your phone, email, etc. while having dinner? Why do you feel compelled to be connected all the time? Are you uncomfortable being alone with no digital distractions? Is technology harming your relationships—with others or yourself? I’m sure you can think of many more questions. I realize most of us, including me, could not easily get along in our business and personal lives without technology. But have we gone too far? Can we have a life without technology or at least some regular time away from it? Today we’re revisiting a post we did some years ago. It’s old, but still relevant—perhaps more so today than when we wrote it. Read it here. I deleted my Facebook account just over 3 weeks ago and it has been wonderful! No going back. Way too many times did I actually get angry at my 3 year old because he wanted me to get off the computer and play with him while I was busy reading Conscious Parenting Facebook pages of all things! It is sad to see pretty much everyone, young and old, now days with at least one device attached to their ear or in their hand when they are out in public. I wonder what this all means for the next few generations? My husband and I were talking recently about the ‘singularity’ that we’re apparently going to reach soon where computers are supposed, mathematically at least, to become conscious. Crazy stuff! I must admit I would be very lost without technology. I do see that it can have negative consequences but for me the positive far outweighs the cons. I know it can be addictive and can encourage antisocial behaviours, but for many it’s a valuable way of reaching out into the wider world. I have an iPhone, an iPad and an iMac computer. For many, having a phone is a lifeline, especially in emergencies. It’s so convenient compared to the days when few people had the luxury of home telephones and had to find a call box! Computers have had such an impact on every area of our lives. Commerce, communications, medicine, education, the list is endless. I personally use the net to do my shopping, which saves traipsing round with a child in tow. And I use it for my portrait photography, not only editing images but also posting them online and making them available for purchase. Indeed we wouldn’t be participating on this blog if we didn’t have the net. I do think its important not to let technology rule your life but we are living in a digital era and we need to be able to strike a balance, both embracing the advances technology has made yet remembering to make downtime where we can relax in peace without the distractions. Thanks very much, Sarah. You said it all perfectly — balance is the key. Funny this came up after i just deleted my facebook, twitter, etc. accounts, a distraction i can live without. plus it has been amazing replacing this extra quantity of time with quality. love. Funny you should ask. I just got a new phone. No I’m not tied to it. When my son goes out west with his dad it’s cheaper to text him to say everything is ok than it is to call him on the land line. I use to use it to call work in order to get into the store before 6 am. I’m hardly on it at all and on occasion I misplace it and have to use the house phone to find it……I just follow the sound. The computer I am not on it as much as I use to be. I still write my stuff in a notebook then type it up later, editing if I need to while typing. I was without both phone and computer for a week, didn’t miss it though I did miss my lights and heat. But so many people are constantly talking and arguing over the phone and everyone around them can hear the conversation. It seems they are afraid to be alone with their own thoughts and in a way this is detrimental to them. Ah, Frederic, you gave me my morning laugh. Thank you. As a very Senior senior, I’m perhaps not as appreciative of technology as most. I would not like to be without a computer, and I only use my cell when I travel. (Which angers some.) However, I truly appreciate having access to all the knowledge that is out there. It’s wonderful. Addicted – no, appreciative – yes. I’m not addicted to technology. At all. Oh, and I just shared this great article on Facebook.